Father Marie-Dominique Philippe, O.P., was born in 1912 at Cysoing, in Northern France and entered the Order of Preachers in 1930. He studied theology and philosophy at the Dominican house of studies of Le Saulchoir and at Paris, and was ordained a priest in 1936. He taught philosophy at the Pontifical University of Fribourg, Switzerland, from 1945 to 1982. From 1982 until two months before his death on August 26, 2006, he continued teaching philosophy and theology at the houses of studies of the Congregation of Saint John in France. 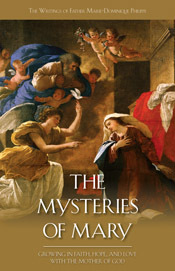 His published works include studies of Aristotle, Saint Thomas Aquinas, and Mystical Theology.